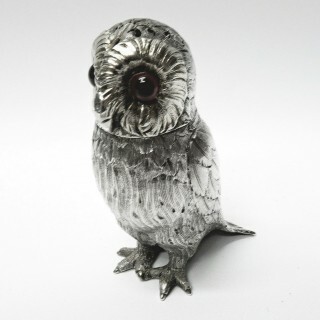 A delightful antique sterling silver novelty salt or small sugar castor in the form of an owl having a detachable head with large glass eyes. 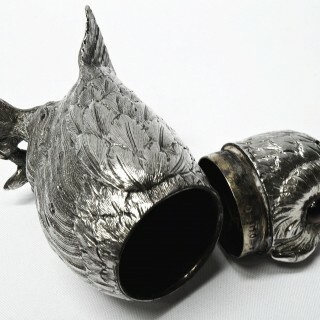 Beautifully modelled and engraved, the quality is very realistic. Gilt interior. 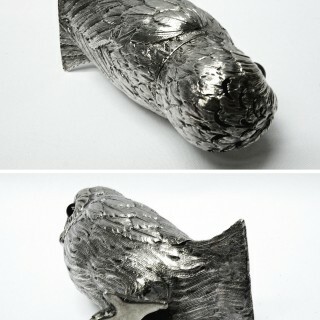 Weight 101 grams, 3.2 troy ounces. 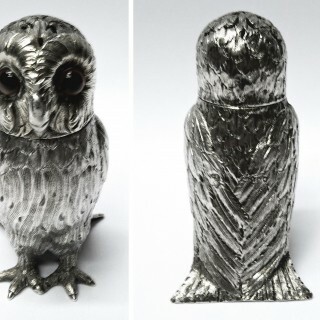 Height 9.2 cms. London 1857. Maker George Richards & Edward Brown. Biography – George J. Richards, son of William Richards (Silversmith & Goldsmith), freed by patrimony 1839. 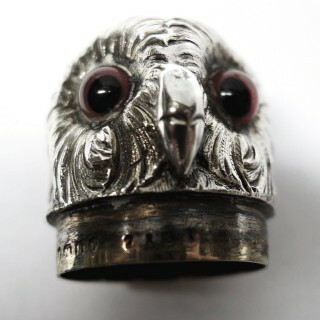 1st mark 1844. In 1857 his former apprentice Edward Charles Brown became partner and they traded as Richards & Brown. Richards retired in 1867. Edward Charles Brown, apprenticed to George J Richards 1845, free 1852. Another apprentice, William Comyns was freed in 1852. Brown became a partner in 1857 trading as Richards & Brown. When Richards retired in 1867 the business continued in the name Richards & Brown until Brown retired at the end of 1882. He died 1883. 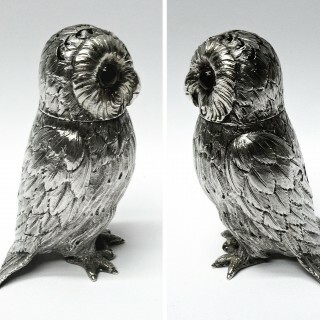 This lovely silver owl is in very good condition. The engraving is crisp. 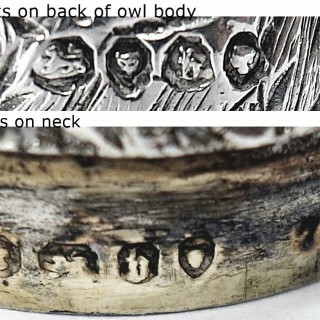 Top and body are completely matching and original; each has a full set of English silver hallmarks. george richards & edward brown.